Most people have many more questions than these. Give us a call for some expert advice! Get a ruler and pencil. Measure the size of your duct opening(s) as accurately as you can. Note whether openings are on floor, wall, or ceiling. If you have less than about two inches of space around any given side of the opening then measure how much space you have and write that down (some wall openings are so far down the wall that they are right next to the floor. That is something we'll need to talk about). Then browse through the different styles of air returns and see what types appeal to you. Then call us up and we'll ask you some questions and think things through. Are cold air returns located on the floor different somehow? Yes, they require more thought because people walk on them and so they have to be stronger structurally than wall or ceiling units. Ones in high traffic areas may require extra reinforcement. I'm laying a new wood floor. I like the clean flush mount look. Do you make those? I have an existing wood floor and I would like to flush mount an air return. Is that possible? Yes, but we hope you are a contractor or at least a very detailed person because this is going to be touchy. 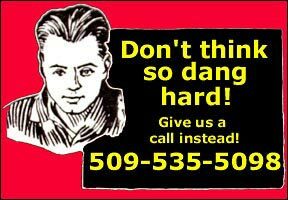 Better call us and we'll fill you in on the intimidating details. My openings are not standard sizes. Do you have anything that will fit? Are you kidding? That is our specialty. Some styles can't be made custom. Others can, but there are extra fees for things like casting molds. But many, or even most, styles can be made in oddball sizes with little extra expense. I'd like matching heat registers. In most cases not a problem. My furnace filter is located in a creepy crawl space or attic. What can be done about that? We have many styles with built in filters so you may just have to go into your hallway to change filters. Yeah, but how do you get a filter in my crazy size? If you can't fit a standard size filter, then your local HVAC company will have filter that comes on a roll that can be cut with a scissors. It is good quality and many types are washable.